There is absolutely no shadow of a doubt that necklaces have been an intrinsic part of our history. While some were designed to hurl away the evil spirits and ensure a peaceful surrounding, others were fashioned as a sign of affluence and influence. Some were also made to indicate a person’s position in politics and the social order. Here is the list such beautiful but expensive necklaces. The “Incomparable” Diamond Necklace has an almost perfect pendant made from a brownish-yellow diamond which is assessed to weigh around 407.48 carats. The stone was preserved in a museum before being cut. It costs a sky-high and further, $55 million. 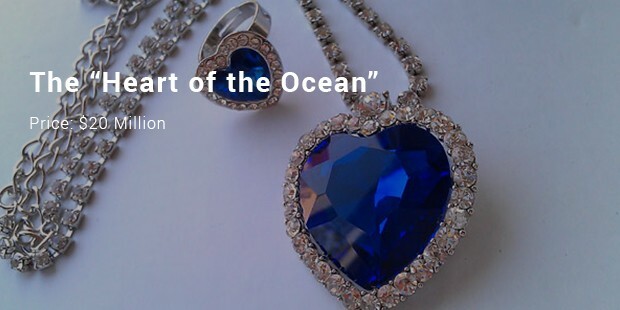 If you have watched the Titanic, you are absolutely aware of this necklace. This was worn by Rose when Jack was sketching her. It has a blue-colored diamond. The movie interested many jewelers to design this. 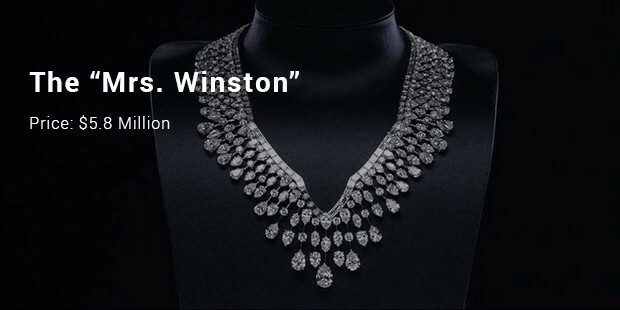 Winston’s version collected a $20 million. 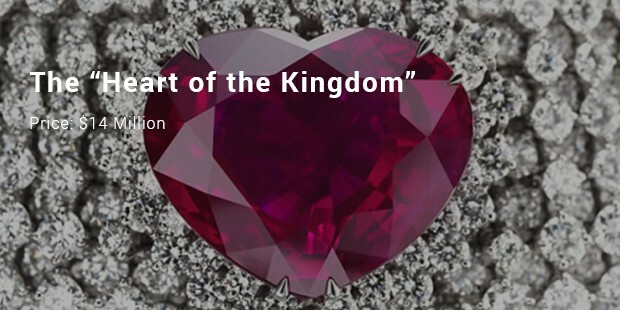 The Heart of the Kingdom was created by Garrard & Company. 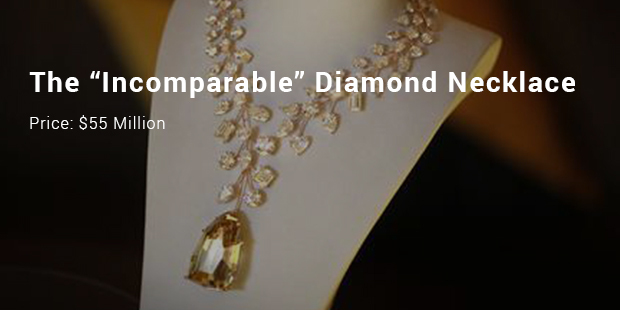 It ranks third on this list of the most expensive necklaces. It has rotund and pear-shaped snowy diamonds studded in a band. It is estimated to be $14 million. This necklace which bears a 75 carat Briolette diamond was sold at a whopping price at Hong Kong’s Christie’s Auction. The necklace had D-internally flawless briolette Type IIa diamond, infact the biggest briolette to be auctioned till date. In the fourth place, we have the 10 million dollar worth, Leviev’s Vivid Yellow Diamond Necklace. It is a stunning 77.12 carat diamond highlighted by a twine of white diamonds. The stone from which it was cut was discovered by Leviev himself. This is a masterpiece in craftsmanship. The elegant piece consists of 52 round diamond pieces weighing 104.8 carats in all. Each piece has a guarantee from Christie’s for quality & clarity. The diamonds are set in such a manner that it sparkles and gives an exclusive look. This masterpiece was sold at an auction in 2013, held at Christie’s in Hong Kong. 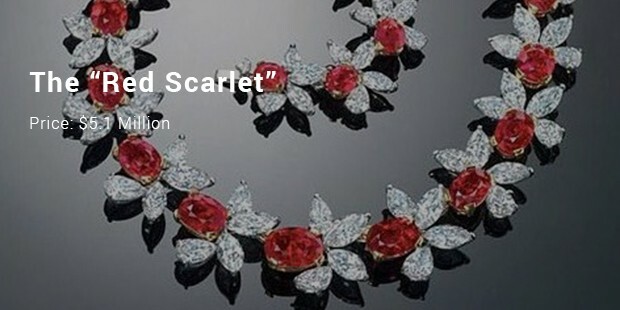 This is the most expensive ruby based necklace ever sold till date. Its elegant look comes from Burmese rubies and white pear and oval diamonds which in totality weighs 87.78 carats. 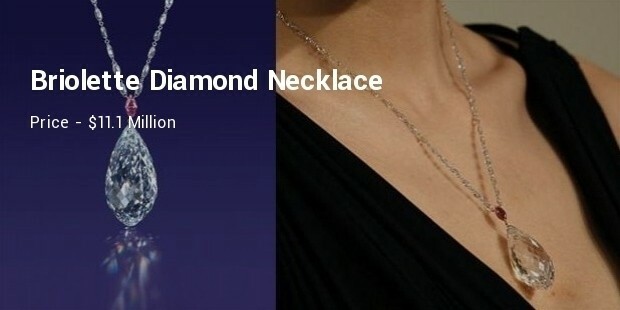 The diamond pieces are so set that it gives a drip effect to the necklace. This elegant piece was worn by Hollywood actress Jessica Alba during 2013 Golden Globe awards. It weighs 187.5 carats in all – three of the biggest diamonds are placed below adding some weight & giving a tapered look. This awesome piece is crafted by eminent jewelsmith James W Currens & was sold at a whopping price at an auction held in 2012. 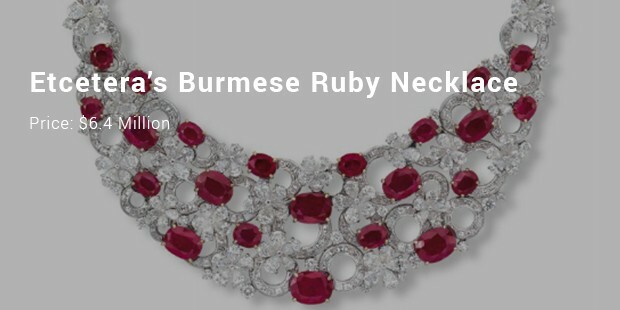 It consists of 26 pigeon Burmese rubies of different weights ranging from 1.27 to 5.38 carats, while each ruby is highlighted by a cluster of white marquise and pear-shaped diamonds. The rubies and diamonds are set in such a manner that it gives an elegant floral effect to the entire set. 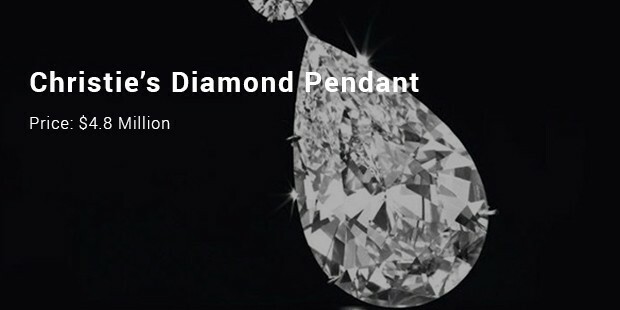 This special Diamond Pendant Necklace was sold at an auction back in 2001, by Christie’s. The elegant master piece features a large and attractive pear shaped diamond linked to a smaller round diamond. The overall look is completed by a simple chain made of white gold. The entire set weighs a whopping 47.49 carats. 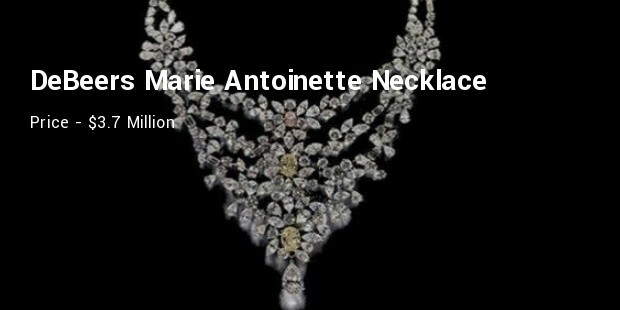 This one is named after the Queen of France - Marie Antoinette, this necklace reflects the exclusivity & royal ness of a Queen. 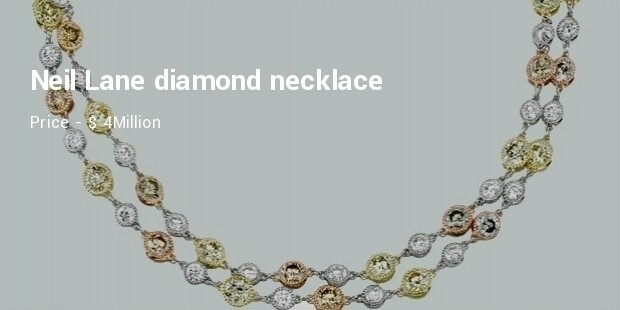 Crafted by De Beers, the Marie Antoinette necklace has a 1.84 carat pink diamond vertically lined in the middle, while two yellow diamonds weighing 7.06 and 5.24 carats respectively surrounds it. 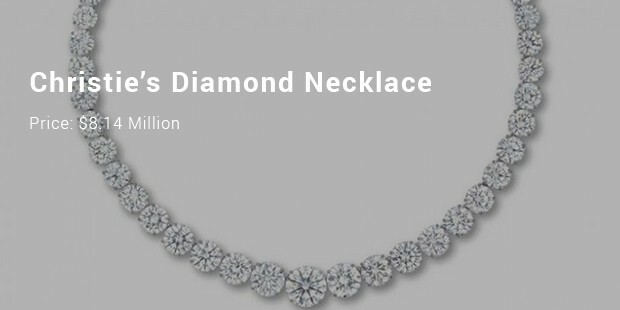 The main diamond, which weighs 8.05 karats, acts like an anchor and pulls the chokers down straight and fully emphasizing the overall shape and style of the necklace. Aren’t these necklaces just mind-blowing and absolutely ravishing? Well there price tags speak for themselves. Made from finely cut diamonds and engraved with rubies and pearls these necklaces are worth every dollar bill, that is if you have them!